North Tonawanda’s Oliver Street was the beating heart of its Polonia, everything one could need could be found along Oliver. To practice their faith, one could attend Our Lady of Czestochowa Church, for food stuffs there was Vic & Kai Delicatessen and Rudzinski’s Grocery and Meat, social events were held at the Dom Polski, and for a bite to eat and a drink, the Poles of North Tonawanda could visit one of the many taverns of Oliver Street. An urban legend from North Tonawanda states that at one time Oliver Street had more bars per mile than anywhere else in the U.S. While never proven, it is easy to see why it was believed. The street was home to the Oliver Hotel, Vienna Grill, Topolski’s Restaurant, Our Inn, Edie’s Cafe, Dziomba’s Cafe and Restaurant, East Avenue Tavern, and scores more. One of the Polish bars located on the heart of Oliver was Litwin’s Grill. Litwin’s Grill was the brainchild of Peter Litwin. Born in Poland in 1895, Litwin arrived in North Tonawanda in 1911 and began working at Buffalo Bolt. Soon Peter started a barbershop and drinkery, becoming a well-known citizen in North Tonawanda’s Polonia. The end of Prohibition led to a great boom in restauranting with both new entrepreneurs and speakeasy owners wanting to turn legitimate. 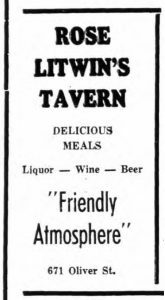 Seeing an opportunity Litwin converted his shop into a restaurant and on July 1, 1937 opened Litwin’s Grill for business. Peter’s time running the grill would be short suffering a stroke and passing away November 17, 1937. The responsibility of the new enterprise would fall on Peter’s widow Rose. Haven seen her husband run the grill, Rose was no stranger to running the business. She also wasn’t a stranger to the important role taverns played in the community. Bars like Litwin’s, Jo & Stan’s Restaurant, Nowak’s Grill, Club 416, and the Mirror Room were more than just a place to get a drink and a bite to eat, they served as a bridge between the Poles’ public and private lives. For the cramped homes of Ironton, the tavern served as the parlor to meeting friends, the ballroom for special celebrations, and the kitchen for when extended family comes over. Sigma Chi Sorority, and the Buddy Club Golf Club. Polonia organizations like the Stephen J. Sikora Post 1322 and Our Lady of Czestochowa clubs would meet at the grill as well. To accommodate all these, Rose, with the help of her children, created an inviting place with a friendly atmosphere where one could have a good time. The bar had a selection of beer, liquors, and wines while the menu offered sandwiches, turkey, beef on weck, fried chicken, chill con carne, golumpki, and on Fridays a fish fry. The family prepared the food in the early years until Helen Socha was brought on as head cook in 1950. Before retiring in 1960, Rose added a new twist to the grill when she opened Litwin’s Blue Room in 671. Both the Blue Room and the grill became hot spots for polka music aficionados from North Tonawanda and beyond. The two locations also sponsored bowling teams with the grill winning the 1955 DeLuxe ‘B’ Bowling Championship. Rose’s son Henry P. Litwin took over running the drinkeries after her retirement. Henry would maintain the tavern his parents ran up into the 1980s, shutting it down shortly before passing away in 1987. A generation after the closing of Litwin’s Grill there are still a number of taverns left on Oliver Street and a few that still have a connection to North Tonawanda’s Polonia. "Bernie Ambrusko Receives Buddy Club Golf Trophy." The Evening News [North Tonawanda, NY] 18 Dec. 1950: 12. Print. CortM. "Who We Were, Who We Are." Who We Were, Who We Are. The Three Thousand Project, 8 Oct. 2009. Web. 11 Mar. 2017. CortM. "Warren Harding." The Three Thousand Project. N.p., 15 Oct. 2009. Web. 11 Mar. 2017. "Cpl. Roman Litwin Discharged, Wears Six Battle Stars." The News [Tonawanda, NY] 7 Nov. 1945: 6. Print. Dehnert, Edmund J. "From Neighborhood Tavern to Parish Hall: An Evolution of Polish-American Folklife." The Great Lakes Review 11.2 (1985): 3. Print. "Henry Litwin (1926 - 1987) Ssdi BillionGraves." BillionGraves. N.p., n.d. Web. 11 Mar. 2017. "Joseph Litwin, Overseas, To Wed Miss Ziezulewicz." The News [Tonawanda, NY] 2 May 1944: 4. Print. "Legal Notices." Tonawanda News [Tonawanda, NY] 3 July 1964: 16. Print. "Letters Are Issued In Twin City Estate." Union-Sun & Journal [Lockport, NY] 7 Dec. 1937: 8. Print. "LIQUOR LICENSE." The Evening News [North Tonawanda, NY] 27 Oct. 1937: 15. Print. "LIQUOR LICENSE." Tonawanda News [Tonawanda, NY] 22 Aug. 1960: 3. Print. "LITWIN." Tonawanda News [Tonawanda, NY] 22 June 1967: 14. Print. Litwin, Steve. "The Lachut Brothers." The Lachut Brothers. Polish American Journal, n.d. Web. 11 Mar. 2017. Litwin, Steve. "Steve's North Tonawanda Page." Steve's North Tonawanda Page. Roots Web, 25 Mar. 2005. Web. 11 Mar. 2017. "Litwin Blue Room Defeats Leaders In Deluxe 'B'." Tonawanda News [Tonawanda, NY] 26 Sept. 1956: 14. Print. "Litwin Funeral to Be Held Saturday." The Evening News [North Tonawanda, NY] 19 Nov. 1937: 3. Print. Litwin's Grill. The Evening News [North Tonawanda, NY] 15 Dec. 1949: 20. Print. Litwin's Grill. The News [Tonawanda, NY] 29 Dec. 1952: 9. Print. "Litwin's Grill Is Champion Of DeLuxe 'B' Bowling Loop." Tonawanda News [Tonawanda, NY] 30 Mar. 1955: 16. Print. Litwin's Restaurant. The News [Tonawanda, NY] 16 Feb. 1946: 5. Print. "Mrs. Rose Litwin." Niagara Falls Gazette [Niagara Falls, NY] 22 June 1967: 17. Print. "North Side Men Graduate From Armament School." The Evening News [North Tonawanda, NY] 19 May 1943: 6. Print. "N. T. Dodgers Meet Tomorrow Afternoon." The News [Tonawanda, NY] 22 Nov. 1947: 6. Print. "PERSONALS." The Evening News [North Tonawanda, NY] 11 Nov. 1937, Society sec. : 6. Print. "Peter Litwin." The Evening News [North Tonawanda, NY] 17 Nov. 1937: 3. Print. Rose Litwin Tavern. The News [Tonawanda, NY] 30 Dec. 1944: 7. Print. Rose Litwin's Tavern. The News [Tonawanda, NY] 28 Oct. 1944: 3. Print. "Sikora Post Thanks Those Who Aided The Baseball Team." The Evening News [North Tonawanda, NY] 24 Sept. 1949: 6. Print. "Sorority to Open Social Harvest With Harvest Dance." The Evening News [North Tonawanda, NY] 15 Sept. 1949: 8. Print. "These Businesses Send Soldiers The 'Gift-NEWS'." The Evening News [North Tonawanda, NY] 19 May 1943: 6. Print.